Over the last few years, on and off, I’ve been writing some beginner’s guides to medieval history. The main idea is that these are the sort of books I wish I’d had when I was younger, telling the story of English history in a light and not too complicated way but also trying to be funny about it (I was just too old for Horrible Histories, although I love the TV series, almost to the point of obsession). It was originally one book about medieval England, started about 14 or 15 year ago, but with the anniversary of Magna Carta approaching I decided that taking one chunk of it and turning it into a Kindle Single might work quite well. That first edition attracted the interests of a US publisher and so the original idea of the full history of medieval England came out, but as five books. 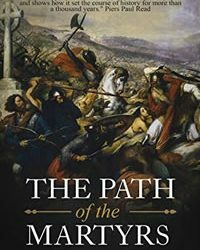 But while writing that, and the upcoming (much bigger) Game of Thrones book, I also read a lot about medieval France and the glories of Moorish Spain, and in particular the subject of Charles Martel and the Battle of Tours in 732 when the Franks beat an army of the Umayyad Caliphate. It seems such an important, central starting point to the idea of Europe (the word ‘Europeans’ is only first used in reference to the battle) but I couldn’t find any beginner’s guide to the events. There are some Victorian books about it, which tend to get a bit carried away with the romance of the event, and occasionally carrying some slightly sinister fantasies about Germanic military prowess. There are also some solid academic works on the period but nothing more popular (or middle-brow, you could say). So I’ve written one myself, a short ebook called The Path of the Martyrs, as a sort of coda to the English history series, but about the Franks. It’s only 99p and is very much in the style of the others, so don’t buy it if you’re looking for a work of academic rigour; there are solid works of research out there by the likes of Peter Brown, Chris Wickham and Paul Fouracre, which I list at the end. If you just want something light to read one afternoon while you’re on holiday in the south of France drinking a bottle of red, then this is probably for you. The great river Loire runs for over a thousand kilometres from mountains to ocean and drains a terrain the size of England. This waterway, the largest in France, pumps out 900 cubic metres of liquid every second into the Atlantic, along its long journey west giving life to one of the eight wine regions of France. Synonymous with such names as Chinon, Muscadet, Touraine and Sancerre, the Loire valley is blessed with rich, fertile soil and, lying on a crossroads between north and south, has been among the most heavily fought over territories for over two millennia and beyond. It was here that Julius Caesar defeated the Gauls and the Franks fought Vikings, Normans battled against Angevins and later Frenchmen heroically defended their land from English invaders in the long and brutal conflict later termed the 100 Years War. The river is fed by no fewer than 21 tributaries, among them the Vienne which, at over 360km in length, is itself longer than any waterway in Britain. This flows north from the Plateau de Millevaches in Limousin and has four tributaries of its own, including the Clain, which serves the historic town of Poitiers. North of the city, on a stretch of land where mother and daughter river run almost in parallel, lies the village of Moussais-la-Bataille, set on a slight hill and giving an overview of the surrounding area. It was here, between the Vienne and Clain rivers, where the fate of Europe was decided one autumn day in October 732, during the continent’s darkest period. Here on a small hill where a Frankish force, assembled at speed to resist the oncoming conquest of their country, steadied themselves to face an approaching army from Moorish Spain, a force heading for the holy city of Tours to make a winter base – and so establishing a bridgehead for the subjugation of Francia. The legion from the south outnumbered the defenders and, as many of the men standing on that hill would have known, their advantage in military matters was as great as their cultural superiority. The charismatic and courageous Arab leader Abdul Rahman Al Ghafiqi did not expect to be seriously troubled, and his confidence was understandable. They fought for the most powerful empire in the world and had in living memory achieved a series of victories that seemed relentless and unstoppable, conquering peoples far more advanced than these northern barbarians. The Umayyad Caliphate now controlled the known world from central Asia to Spain’s Atlantic coast, ruling over 11,000,000 square kilometres of land, in size comparable to the modern United States and Mexico combined. Their domains included some of the planet’s most densely populated and developed regions, and most of its largest cities. The Caliphate was without question the most powerful military force on earth, and seemed destined to extend its control into the desolate ruins of western Europe. For beyond the mountain range separating Al-Andalus from Gaul lived only the lingering remnants of the Gallo-Romans, speaking a degenerate form of Latin in their ruined, depopulated cities, and beyond them were mere unlettered primitives. These were the descendants of German tribes who had settled in Gaul when Roman authority collapsed in the fifth century, and who had little in the way of civilization or learning. The eastern world was entering what later became known as the Islamic Golden Age, its great cities home to countless philosophers and mathematicians, highly-educated men fluent in a number of languages and combining Greek, Persian and Syriac influences to produce a rich and enviable culture. The Arabs had quickly absorbed the eastern provinces of the old Roman Empire, lands vastly richer and more heavily populated than these dismal regions beyond the Pyrenees, and yet they had mostly collapsed against the onslaught – so how could these northern men trouble them? Having subjugated North Africa, in 711 the forces of the Caliphate had crossed the straits of Gibraltar and overrun the Visigoth kingdom of Spain in months. Now, just two decades later, the conquerors of Hispania marched into the former Roman province of Gallia Narbonensis, today’s Provence, moving north with virtual impunity and destroying a Latin-speaking army by the River Garonne. The host came with a large number of fighting men and, ominously, some had brought their families with them. Progressing along the old Roman road north, the coming conquerors of Gaul made for the city of Tours on the banks of the Loire, rich in treasure and crucial for control of the region. Were they to capture the old town before the winter set in then Francia would be theirs. And so in October 732, some 12 miles beyond Poitiers, a force led by Al-Rahman arrived between the Vienne and Clain where they saw for the first time the army of the Franks, led by their duke, Charles. From the village of Moussais-la-Bataille one can stand near to where those early Frenchmen waited that day, with its view across the open ground where they would have seen the approaching host marching from Aquitaine. Al-Rahman’s army brought with them an elite cavalry force, at a time when no infantry had successfully withstood such a form of warfare. They had crossed Gaul without too much cost. The Moorish leader’s confidence was justified. As the invaders approached, Charles had his men lock their shields, forming into two rows, tightly-packed, their aim to defend the slight hill that ran parallel with the old Roman road. They could not match the Arabs for speed and would need to be highly disciplined to combine their infantry and cavalry forces, something no northern army had managed before. Many of the men facing the onslaught from beyond the Pyrenees would have been farmers recruited along the way as the Frankish leader desperately raised an army from the north, answering the call of their lord. No doubt many would have been paralysed with terror, for the Franks were most certainly outnumbered, and facing far superior horsemen. This was the moment, in the words of historian Henri Martin, when ‘the world’s fate was played out between the Franks and the Arabs’. Love it! Can’t wait to read the rest of this book and future ones, too. Just bought it via amazon.de, looking forward to a good read!